It’s white, it’s strapless, and it’s looming in the near future: my wedding dress. Somehow, this inanimate object made of delicate material has more power over me than an intense boot camp instructor when it comes to forcing a ten mile run followed by 500 crunches. Though hearing a white dress say “drop and give me 20” is borderline behavior, the hard deadline of my wedding is actually a helpful force motivating me toward longstanding fitness goals. They key is not letting wedding fitness take over my otherwise (somewhat) stable mind. This is arguably easier said than done, but a few ground rules can help. While my own wedding is still about three months away – leaving plenty of time to reach insanity of bridal proportions – here’s how I’ve been getting in shape for my wedding without losing my mind. Before any DJs were booked or dresses were purchased, I started increasing my wedding fitness regimen. For me, this meant adding 1-2 extra classes each week, and taking small nutrition steps, like eating sandwiches open faced, cutting out the daily high calorie latte and focusing on portion control. If your wedding body goals include significant weight loss, map out a realistic timeline to reach them. Unless otherwise instructed by a medical professional, losing more than 2-3 pound each week can be detrimental to your health (meaning the time to lose 10 pounds is not two weeks before a wedding dress fitting). Try as I might, I can’t stop thinking about wedding planning. Working out is a (necessary) break from all things wedding. My running playlist has nothing to do with possible reception playlists, my yoga intention is far away from ceremony readings and first dance practice does not count as cardio. Take the time to focus on your health – both physical and mental –and turn that wedding planning off for a 60-minute class. If you can keep it off even longer, that’s even better. Cake tastings, dress shopping, venue scouting and planning trips back home can be fun, but can also take time usually spent with friends. Gather your pals for your next fitness excursion, and catch up while slimming down. Upon increasing the number of days each week that I work out, I realized how easy it is to get bored of the same classes. 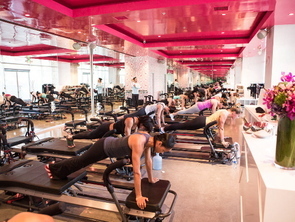 Adding in new, fun classes has helped spice up the routine, and it’s also been an opportunity to try out workouts that it turns out I love (Reformer Pilates convert here!). 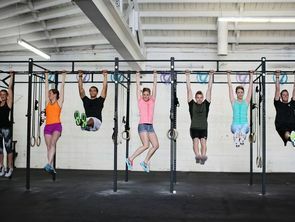 Sign up for whatever class you’ve been intimidated to try (CrossFit, anyone? ), and use your wedding fitness goals as motivation to follow through. On top of the variety factor, the new classes will also help prevent plateau. There are a few pounds and inches included in my wedding fitness goals, which will not disappear without more sweat than usual. My treadmill sprint speed is being gradually pushed past my norm and I’ve increased weights in boot camps, which has produced exciting results. If you’re feeling the plateau, test the boundaries of your own comfort zone. Hint: it’s typically after reviewing the budget. Let fitness calm the crazy, not fuel the insanity. Take advantage of the calming, centering and stress-reducing benefits of exercise, and fold in workouts that balance you mentally with those that push you physically. If it were realistic for me to look like Gisele at the 2008 Met Gala by my wedding day (while still eating complex carbohydrates and drinking wine), I would ditch the slip and buy a backless/sideless dress. Actually, I probably would change the wedding to a bikini theme to fit my new modeling career. As it stands, however, nothing is coming between me and my rosé, and I have yet to find that extra four hours a day for intensive yoga. So, Gisele I will not be, but the realistic fitness goals I’ve set will get me to the Gisele-ist version of myself. Ready for some bridal body boot camp? Check out our fitness class finder for a variety of workouts near you! It is important to take your time and not panic! You kind of expect to drop the weight as soon as you start working out but actually you have to be relentless - the majority of the weight seem to start dropping off after weeks of little progress.